Magnus Lindberg (b. 1958) is among the leading figures in today’s contemporary music internationally. 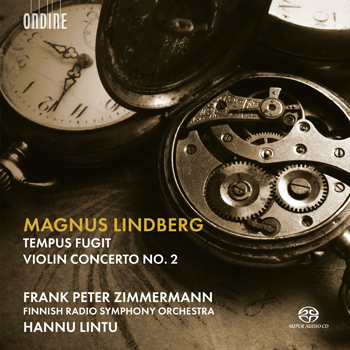 This new release by the Finnish Radio Symphony Orchestra conducted by its chief conductor Hannu Lintu includes world premiere recordings of two new works by Magnus Lindberg: orchestral work Tempus fugit and Violin Concerto No. 2, featuring Frank Peter Zimmermann as its soloist. This release also celebrates the composer’s 60th anniversary. Violin Concerto No. 2, written for Frank Peter Zimmermann, was composed during Lindberg’s tenure as the composer-in-residence for the London Philharmonic Orchestra. It is the composer’s seventh concerto up-to date. This three-movement work represents well Lindberg’s late lush orchestral style and is reminiscent to the tradition of great romantic violin concertos of the past. The concerto has three movements played without a break, with a solo cadenza towards the end of the second movement. The music is at times lucid and bright and at times lusciously sonorous, and the soloist is called upon to display both fireworks and soaring melodic arcs. At the very end of the first movement, the solo violin introduces a warm, romantic melodic motif that recurs several times later on. Tempus fugit was commissioned by the Finnish Radio Symphony Orchestra and premiered at the gala concert for the centenary of Finland’s independence in Helsinki on 6 December 2017. Although the work has a strong positive and even lucid fundamental tone, the composer did not seek to write a traditional anniversary piece. Instead, he sought a new approach through means that he had first employed in the 1980s, going back to the harmonic studies that he had undertaken on computer, using the LISP programming language – the same that he had used when creating his first major orchestral work, Kraft (1983–85). The result, however, is quite different from his edgy, even aggressive, early works: Tempus fugit is a nearly 30-minute orchestral work embracing an Impressionist brightness of colour, melodic lines and a warm Romantic glow. The work is dedicated to Hannu Lintu. Frank Peter Zimmermann is widely regarded as one of the foremost violinists of his generation. Praised for his selfless musicality, his brilliance and keen intelligence he has been performing with all major orchestras in the world for well over three decades, collaborating on these occasions with the world’s most renowned conductors. His many concert engagements take him to all important concert venues and international music festivals in Europe, the United States, Japan, South America and Australia. Zimmermann has given four world premieres, most recently in 2015 of Magnus Lindberg’s Violin Concerto No. 2 with the London Philharmonic Orchestra with further performances with the Berliner Philharmoniker, Swedish Radio Symphony Orchestra, New York Philharmonic and Orchestre Philharmonique de Radio France. Recordings by the Finnish Radio Symphony Orchestra under Hannu Lintu on Ondine have gathered excellent reviews in the international press. Their most latest release, Bartók Violin Concertos with Christian Tetzlaff (ODE 1317-2), was chosen by Gramophone as the Recording of the Month in May 2018. Another recent release with orchestral works and songs by Jean Sibelius (ODE 1289-5) won an ICMA Award in January 2018. The same album was also Editor’s Choice in Gramophone Magazine and Orchestral Choice in the BBC Music Magazine. Copyright © 2019 Ondine, Inc. All rights reserved.